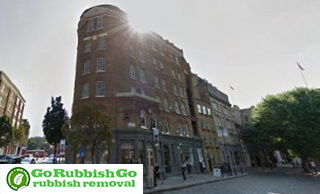 We are known for offering competitive and reliable EC1 rubbish removal services throughout the Clerkenwell area of London. So if you have any excess waste or junk which can’t go out with your normal waste collection call right now on 020 8610 9182 for a quote. Our Clerkenwell waste clearance services are easy to hire and won’t cost you above and beyond. With our flexible and comprehensive approach, we can even help you with everything from start to finish. So if you want a firm that will go the extra mile for you, make sure it’s our number that you call! We guarantee to provide you with a spectacular service that will leave no piece of junk or waste behind. Is your spare room full of junk? Or is our attic bursting at the seams? Then you could benefit from one of our deals. 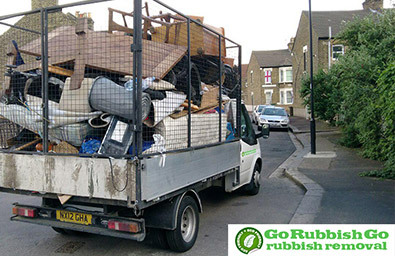 Perfect for helping you with one-off jobs or large clear-outs, our rubbish removal deals are second to none. With our help, you can have a clean and tidy house without even having to lift a finger. So if you want to save yourself a whole lot of time and energy, make sure you book one of our great, one-off deals! Our waste disposal EC1 experts can pop round to any address in Clerkenwell, EC1 ASAP, and collect any old junk that you no longer need! Our workers will even make sure that your recyclable waste is taken care of in an eco-friendly manner! Save money now! Regular Clerkenwell Waste Removal Services at Low-cost Prices! Do you need to book a regular waste removal service? Then Go Rubbish Go has a great selection of low-cost deals that are just for you! Ideal for anyone who can’t manage with the limited council collections, or for anyone who has regular excess waste, our packages are guaranteed to impress. So if you don’t want to stress out about your rubbish disposal in EC1, ask us for a free and no obligations quote. We can take the headache out of your waste problems without any unnecessary cost or delay. 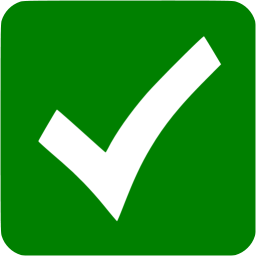 If you’re not sure whether we can help, check out some of our customer testimonials today. We have a flawless customer satisfaction record and are always happy for you to take a look. Hired the company to handle the rubbish in my loft. The team they sent to Clerkenwell was really helpful! The two men safely collected all of the junk and loaded it on the van. Really fast and impressive service! The best rubbish clearance service in EC1! What Makes Our EC1 Waste Collection Services Unique? In order to make sure that our firm is the best, we have ensured that all of our workers are complete and utter professionals. With excellent training and on-the-job experience, you won’t get a better level of service anywhere else. In addition to this, our team also have the best equipment in the EC1 area, with modern rubbish trucks and state of the art equipment. 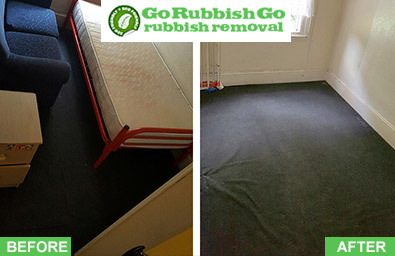 So if you want to use a rubbish removal team that has the know-how and facilities to excel, call us on 020 8610 9182. Our customer services team are trained to help you with your waste removal in Clerkenwell and can offer you excellent advice about all of our competitive packages. Book Your Waste Clearance in Clerkenwell Today to Speed Up the Process! So if you want to enjoy competitive and reliable rubbish clearance in EC1, Clerkenwell there is only one number which you need to call – 020 8610 9182! 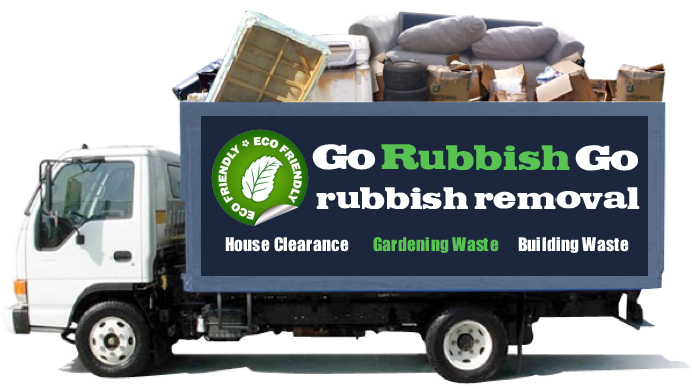 Go Rubbish Go has an extensive range of commercial and residential waste disposal packages and will always be happy to give you a quote. With modern equipment and excellent training, our workers can collect and dispose of all sorts of junk and waste with no questions asked. So if you want to have a clear-out or simplify your general waste collection Clerkenwell, treat yourself to one of our unbelievable local offers! Clerkenwell is part of the Borough of Islington in Central London and has a long and interesting history. The name comes from Clerks’ Well – a well in Farringdon Lane where the clergy of the London Parish gathered annually to perform mystery plays during the Middle Ages. The Priory of Clerkenwell housed the headquarters of the Knights Hospitallers Order and St John’s Gate, the restored Priory Gate, has survived to this day. Clerkenwell changed significantly with the Industrial Revolution and from a once residential district turned into an industrial hub. Industrial decline after WWII led to the Finsbury Borough Council commissioning several housing estates, including the Finsbury Estate built in 1968, and today the area is mostly residential with plenty of pubs, restaurants and bars. The only station within the district is Farringdon station, providing both rube and rail services.